Dentures are commonplace enough that we all know what they are… Or do we? Until recent years dentures were those strangely eerie removable teeth that our parents or grandparents wore and that we were warned we’d have to wear if we didn’t take good care of our teeth. Every night we’d see them take their teeth out and place them in a jar by their bedside, and occasionally we’d see them behave strangely in their mouths or just fall out if they weren’t careful. These are the dentures of the past and are now known as removable dentures, but they aren’t the only option available. The new generation of dentures aren’t the old pink plastic and fake tooth varieties we were used to, but instead are an incredible leap forward that utilizes titanium implants in your jaw. These mounting points are used to connect a partial or full set of artificial teeth to that look and behave, like real teeth. Unlike the previous dentures, these provide incredible chewing potential that will allow you to return to your favorite foods without hesitation or discomfort. There are two varieties of these implants, each with their own benefits. 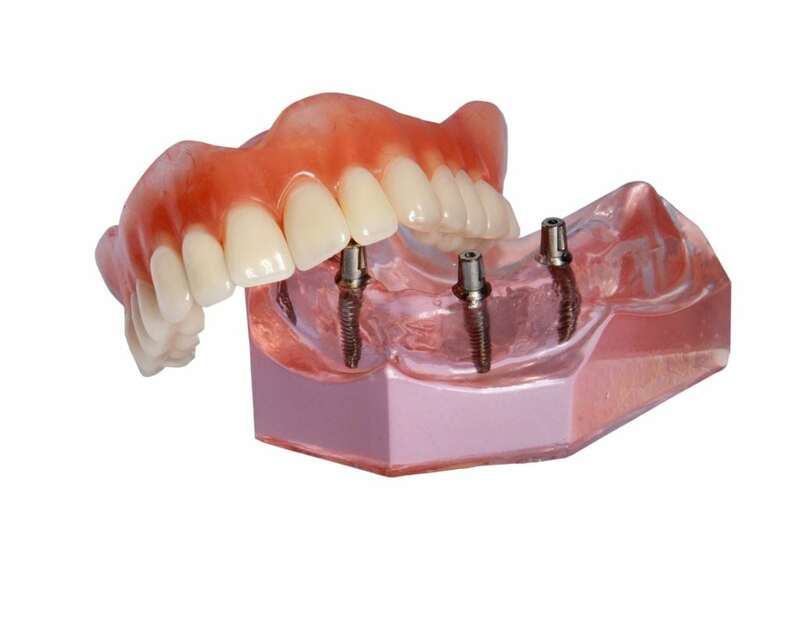 • Fixed Implant Retained Dentures – These implants require more mounting points than the alternative, but also provide greater stability and freedom. These dentures are only removed at your twice yearly checkup with your dentist when a thorough over and under clean is performed. Otherwise, they stay in your mouth and give you the sensation of having a full set of real teeth again, with all the chewing ability that implies. • Removable Implant Retained Dentures – These, on the other hand, require fewer mounting points and are less expensive as a result. In some cases, these require that some of the upper plates be retained, but generally, you’ll be able to have less plate than usual, allowing you to enjoy foods flavors and sensations much better. While not quite complete in its restoration of your ability to chew, it approaches nearly natural chewing. The benefit of this form of denture is you can remove and clean it yourself when necessary, instead of waiting for the dental visit. In both cases, you’ll want to return to a normal brushing regiment to ensure that your teeth remain beautiful and stain free, though you’ll want to switch to a soft-bristled brush to avoid damaging your new teeth. The removable implant allows you to take out your dentures and clean the gums underneath as well as the dentures as a whole before returning them to your mouth. If you’re looking at getting implant dentures to be sure to contact your dentist today for a consultation. When you’re working with an expert like Dr. Duc Pham at Premier Dental of South Orange County, you’ll know that you’re getting the best care and the best advice in choosing your new dentures. Don’t let another day go by suffering with imperfect teeth, take the plunge and look into getting implant dentures that will give you your bite back.